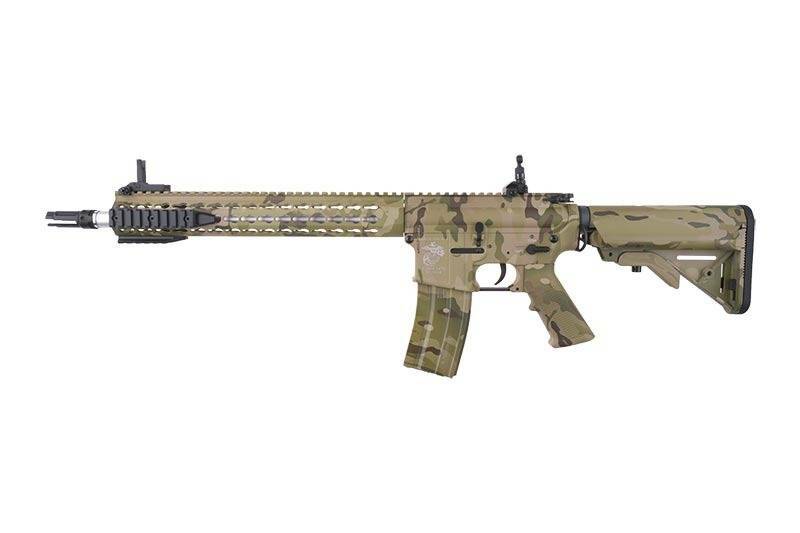 Specna Arms SA-B14-MC KeyMod 12" (Multicam). 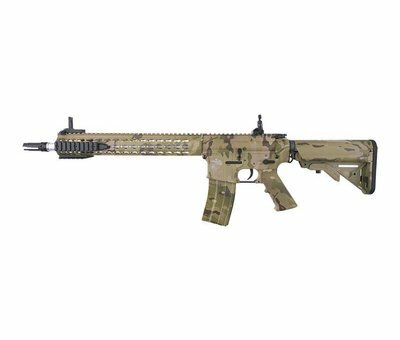 SA-B14 assault rifle replica by Specna Arms is made largely from a uniform zinc and aluminium alloy, reinforced with steel elements in the most vulnerable points of the replica (steel elements - all the screws, pins and tactical sling swivels). Both the SF stock storing the battery and the pistol grip were made from polymer. The receiver of the replica has undergone the process of anodizing, which guarantees high degree of protection against corrosion. The paint was applied via a process of powder coating, after having the surface undergo the same process prior to the application of paint. This provides a much higher than usual resistance of the applied paint to abrasion. The receiver bears USMC markings. The replica is fully compatible with LiPo and LiFe batteries. 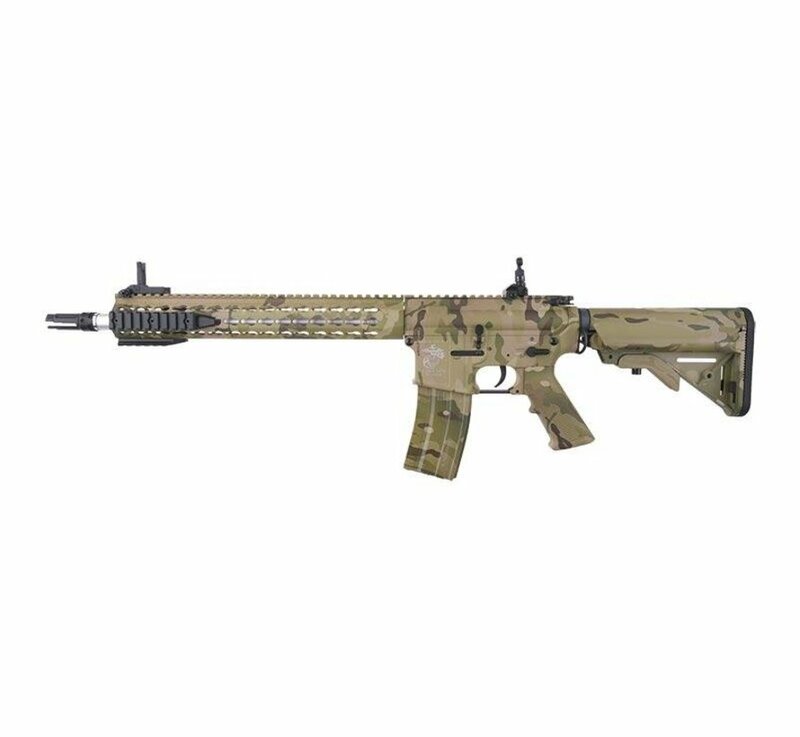 Due to base muzzle velocity of ~420 FPS provided by the main spring installed by default by the manufacturer, the replica is perfect for operating on a medium range. The set also includes an M90 spring, which allows to reduce the muzzle velocity to ~320 FPS and as a result to adapt the replica for close-ranged and indoor operations. This model features a modular KeyMod forend 12” long. 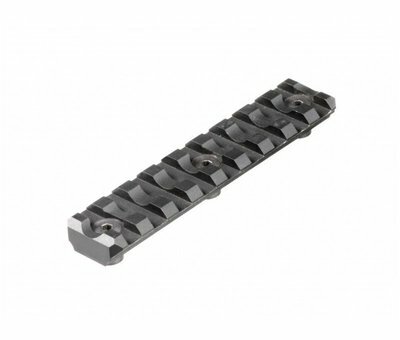 Dedicated segments, for instance, RIS rails (KeyMod nuts) can be attached to the KeyMod forend in any position or configuration due to holes placed around the grip (KeyMod slots). The set does not contain a battery and a charger.